Seventy five years ago, on August 23, 1939 Germany and the Soviet Union signed one of the most well-known diplomatic documents in human history: the Non-Aggression Pact (hereinafter referred to as the Pact). 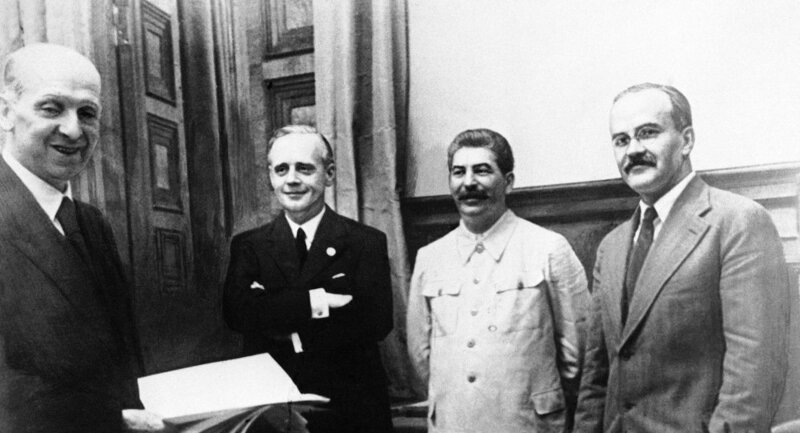 Ignoring the official title of the document, Western politicians and journalists dubbed it the Molotov-Ribbentrop Pact. They accused the Soviet Union, and are now accusing Russia, that by signing the Pact, the Kremlin made this country an accomplice of the Nazis in unleashing World War II. This assertion is an impudent and cynical lie designed to lay their fault at our door. Who released Hitler from the Versailles chains? In reality German Nazism was a product of the much-lauded Western civilization, and it was the so-called Western democracies that assisted Adolf Hitler in unleashing the second global massacre. This is confirmed by numerous facts. It is no accident that the West shies away from them like the devil from holy water. Britain and France left the first tracks on the road to a new war soon after the Nazis' rise to power in Germany. In less than half a year, on July 15, 1933 Britain, France, fascist Italy and Nazi Germany signed the Agreement on Understanding and Cooperation in Rome. As distinct from the leaders of the Weimar Republic, whom London and Paris kept on a short leash, they instantly introduced Hitler's Germany into the club of great powers and began talking with it as their equal. The Western democracies did not neglect the fact that Hitler had long urged Germans for a crusade to the East to capture resources and Liebensraum (living space). Having signed the four power pact, Hitler not only scored a major diplomatic success, but also launched his Drang nach Osten (drive toward the East) to Russia's limitless space. This fully conformed with the interests of London and Paris. They were pushing the Nazis exactly in this direction. Indicatively, while cursing the Molotov-Ribbentrop Pact, the West carefully forgets the four-power pact that launched the policy of appeasing the aggressor at the expense of territories and the interests of third countries. Another important agreement that gave enormous benefits to Germany is buried in oblivion as well. On June 18, 1935 British Foreign Secretary Samuel Hore and his German counterpart Ribbentrop signed the Anglo-German Naval Agreement by exchanging notes. It fixed a ratio whereby the total tonnage of the Kriegsmarine was to be 35 percent of the total tonnage of the Royal Navy on a permanent basis, and allowed Germany to launch a large-scale program for building submarines. This amounted to a revision of the Treaty of Versailles. Hitler dealt the next blow to the "chains of Versailles" in 1936, when he occupied the Rhine area that had been seized from Germany in 1919. London and Paris kept silent. A civil war broke out in Spain. Germany and Italy backed General Franco. Spain turned into a testing ground where German "supermen" acquired useful combat experience. The appeasement policy reached its peak in September 1938 with the signing of the Munich agreement by Hitler, Italian dictator Benito Mussolini, UK Prime Minister Neville Chamberlain and his French counterpart Eduard Daladier. Under this agreement the Sudetenland was annexed from Czechoslovakia with all material values and transferred to Germany. Bits of it were snatched by Hungary and Poland, which Winston Churchill compared to a hyena. Chamberlain and Daladier were not in the least worried by the fact that, along with the bloody dictators, they tore apart the territory of a democratic and peace-loving country in the absence of its leaders and violating its Constitution. They were pleased that far from being able to help Czechoslovakia, the USSR found itself in isolation in the world arena. Euphoric from his "success," Chamberlain forgot that when departing for Munich, he promised the Czech leaders to take into account the interests of their country. In reality he remembered about this just as much as the German, French and Polish foreign ministers remembered about their promises to Ukrainian President Yanukovych in February 2014. Meanwhile, Chamberlain did not forget to sign the Anglo-German declaration of non-aggression. According to historian Oleg Rzheshevsky, this document and a similar French-German agreement of December 6, 1938 "were essentially non-aggression pacts." Following the great powers, non-aggression pacts with Germany were signed by Denmark, Lithuania, Latvia and Estonia. Indicatively, the Baltic States do not curse themselves for doing so. Throughout the 1930s, up to August 23, 1939, the Stalinist leaders of the Soviet Union persistently pursued the policy of collective security but the efforts of the aggressor's appeasers compelled them to renounce it. A turn in Kremlin's foreign policy was preceded by tripartite talks between the British, French and Soviet military missions in Moscow. Responsibility for their breakdown rests with Britain and Poland. The former was merely marking time in an effort to prevent Soviet-German rapprochement, while the latter bluntly refused to accept Soviet military assistance, hoping for help from London and Paris, although the German axe had already been held over Poland's head. It is important to understand that in August 1939, the partition of Poland or Europe or Soviet-German peace did not matter so much. The main question was where Hitler would send his troops after Poland's defeat: to the East or the West. Regardless of one's attitude toward Stalin and his domestic policies, one should admit that being driven into the corner, he made the only right choice. Stalin outwitted the arrogant Brits, who had won many diplomatic battles. By signing the Pact with Germany he let London and Paris taste the bitter fruit of appeasement, and gained time to prepare for the decisive battle with Germany and rid the USSR from the threat of war on two fronts: the armed conflict with Japan at Khalkin Gol was still going on. British historian Alan John Percival Taylor wrote that the German-Soviet Pact was not an alliance but a mutual exchange of promises on non-aggression and neutrality, but it caused a stir in the West, which blamed Soviet Russia for striking a criminal pact with the leading Nazi power. Taylor finds it hard to understand the criticism by British and French politicians, who had actively contributed to the partition of Czechoslovakia and even tried to sign a new agreement with Germany at Poland's expense. However, people who see the speck in someone's eye but fail to notice the beam in their own still continue to reproach Russia. "This Pact (as well as the Anglo-Franco-Soviet talks that ended in failure) shows that it is no longer possible to resolve important issues of Eastern Europe without active Soviet participation, and that any attempts to bypass the USSR and resolve them behind its back are doomed to failure." Barred by the West from taking part in settling the Czechoslovak crisis, the USSR returned to the world scene a year later and became a key player. The signing of the Pact was an impressive achievement of Soviet diplomacy. Why not think about giving August 23, 1939 a special place in Russia's historical calendar? Naturally, this idea would lead to heated debates but one thing is clear: 75 years ago the Soviet leadership did nothing for which we should feel ashamed. We do not have any reason to repent.